Introducing solid foods to your baby for the first time can be both exciting and a bit stressful. Alex has been weaning since he was almost 6 months old and he loves his food. 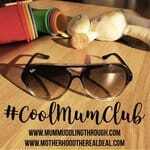 When you start weaning it can be difficult to know what foods to give your baby and when; I found introducing Alex to solid food pretty confusing. 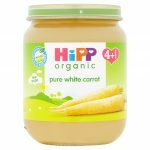 If you decide to start with purees and not go down the baby led weaning route then HiPP organic have introduced a brand new range of baby food perfect for baby’s first tastes. 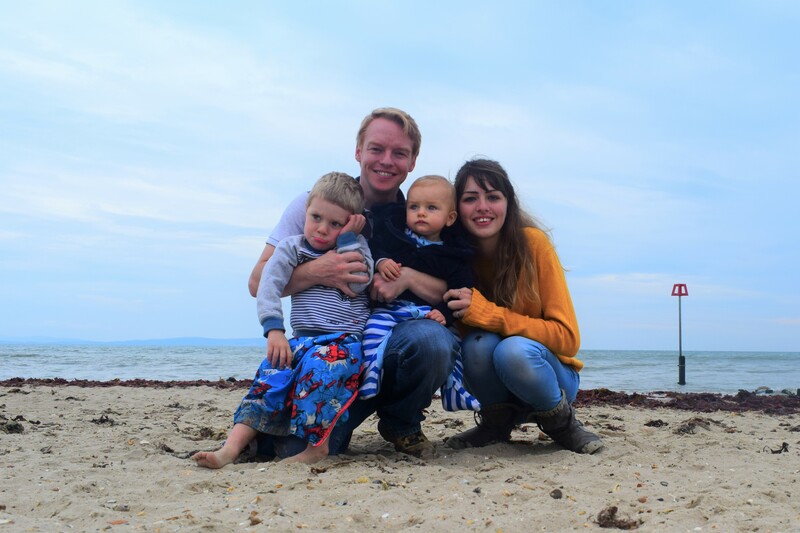 We were recently sent a hamper of the new Pure Vegetable jars and stage 1 savoury jars from HiPP to try, here is what Alex and I thought.. 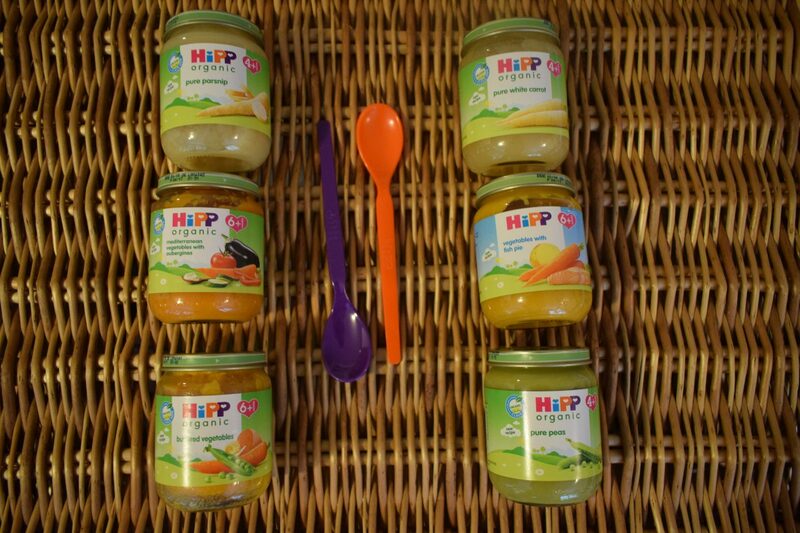 The new range from HiPP makes introducing food into your baby’s diet easier than ever. The Pure Vegetable jars contain just one ingredient, making it easy for your child to get used to the taste of individual foods. As always with HiPP, the baby food is made from organic ingredients to ensure your baby is getting the healthiest and freshest food possible. The new design of the jars also makes feeding easier as the top is extra wide meaning you can easily get your spoon in and out and older babies can have a good go at feeding themselves too. Alex was sent 3 jars from the new Pure Vegetable range to try. As part of the review Hipp asked me to also taste the baby food to see what it was like. 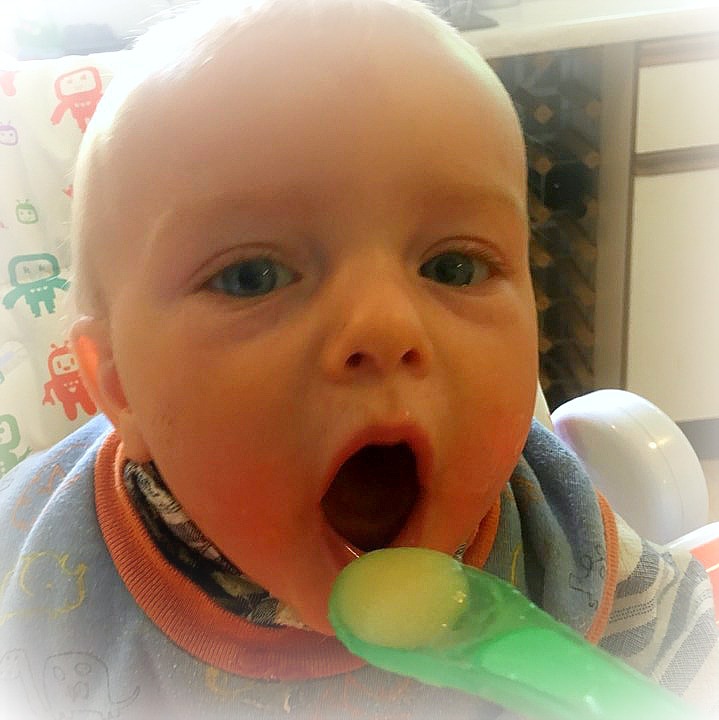 I have to admit I wasn’t overjoyed when I found out I had to be trying the food too (baby food doesn’t exactly look that nice) but I was really surprised when I tentatively put the spoon in my mouth. 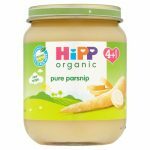 What I thought – When I opened the jar of Pure Parsnips I was surprised to discover that the food smelt exactly like roasted parsnips. To me they tasted exactly like parsnips, yes they were smooth and runny but I would have known it was parsnip even if I hadn’t read the label. What Alex thought – Alex really enjoyed the Pure Parsnips, I tipped it into a bowl for him and he shovelled in into his mouth himself. The texture is very smooth and runny, perfect for a baby that is just starting to eat solid food. What I thought – Wow, the Pure Peas seriously smell like freshly cooked garden peas. The consistency was slightly thicker than the Pure Parsnip but still there were no lumps and it would be easy for a newly weaned baby to eat. I thought the Pure Peas tasted exactly like peas, just peas that had been a bit mushed up. What Alex thought – Alex was not a fan of the Pure Peas. He tried it but he wasn’t overly interested. I wasn’t completely surprised though as Alex doesn’t like peas when they are not pureed so it was unlikely he would like this jar. What I thought – I was intrigued to try this jar. 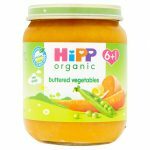 HiPP Organic have specifically made this milder carrot puree to help introduce carrot to your little one’s diet. This jar of food didn’t smell like carrot or really taste like it either but it didn’t tast bad. Maybe it is because this white carrot is milder than the carrot I am used to eating. What Alex thought – Alex loved the white carrot, he laughed his head off after his first mouthful and eagerly waited with his mouth open for more. Alex has already tried normal carrot too but that didn’t put him off munching his way through this jar. 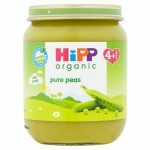 Final thoughts on HiPP Organic Pure Vegetable jars – After trying all three jars I can really see the benefit of having baby jars with just one vegetable in them. Your baby can easily adjust to trying new flavours and as parents it is easy to see what your baby does and doesn’t like. With traditional jars with more than one flavour mixed together it can be hard to tell what flavour it is your baby doesn’t like if they turn their head away from a spoonful of food. The texture and consistency of these jars is ideal for the early stages of weaning, there are no lumps and the smooth consistency makes it easy for babies to swallow and move around in their mouth. Alex is 10 months now so he is too old for these jars really but he still enjoyed trying them and, apart from the peas, liked the taste. Alex was also sent 3 jars from the Stage 1 savoury range. These jars are made for babies from 6 months onwards as they have a thicker texture and more than one ingredient in each jar. What I thought – I really liked this jar! The food smelt really fresh, it reminded me of a homemade pasta sauce. In fact, I would happily mix this into some pasta for Alex as it is a great way to get some extra veggies in. Not that I am going to make eating baby food a habit but I would actually happily eat this again. What Alex thought – Oh my gosh, Alex LOVED this jar. He was making excited little noises as I was loading up his spoon and I could not get it in his mouth quick enough. Alex was clearly disappointed when he finished the whole jar in less than 5 minutes, he is an older baby though so probably could have done with a bigger jar! What I thought – Again, I didn’t need to read the label or taste the food to know what was in this jar. There was a very fishy smell when I opened the jar, it smelt just like fish pie. The consistency was quite thick but not lumpy and it tasted mush nicer than I was expecting. What Alex thought – This fish pie went down a treat, Alex near enough inhaled it he ate it that fast. He had his mouth wide open as he was waiting for the next spoonful and he seemed really content during the meal. He also enjoyed the thicker texture and he was even happy to eat it cold from the jar. What I thought – Ok so I wasn’t overly keen on this one. It smelt like purees I made Alex when he was smaller and while a mixture of vegetables is great for getting your 5 a day, unfortunately it doesn’t always taste amazing. What Alex thought – On the first try Alex wouldn’t eat the buttered vegetables, he had a taste and then wouldn’t have any more. I didn’t pressure him though and we tried again at tea time and he ate the whole jar! I guess he just wasn’t in the mood for butter vegetables at lunchtime. This was a thicker texture too and there were very tiny lumps of vegetables, a great way to start introducing more textured food to your baby. 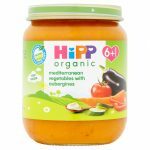 Final thoughts on HiPP Organic stage 1 savoury jars – Alex enjoyed all three of these jars, he loved the thicker texture and they smelt so fresh – just like they had been freshly made at home. I think these jars are great if you are out and about during meal times or if you haven’t got around to cooking anything yourself. The Mediterranean vegetables was Alex’s favourite by far but he enjoyed the others too. The thicker texture and combinations of flavours make these jars a great option to feed a baby who has already tried single flavours one at a time. Alex and I really enjoyed taste testing these jars and I was pleased to learn that the HiPP baby food tastes exactly like it is supposed to. The Pure Vegetables jars are perfect for baby’s first tastes and the stage 1 jars are an ideal sized meal full of nutritious ingredients for babies from 6 months. If you are planning on doing spoon feeding/puree weaning then I really recommend this new range from HiPP. 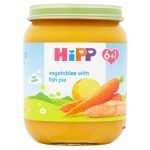 Like the sound of th HiPP Pure Vegetable and Stage 1 savoury jar range? 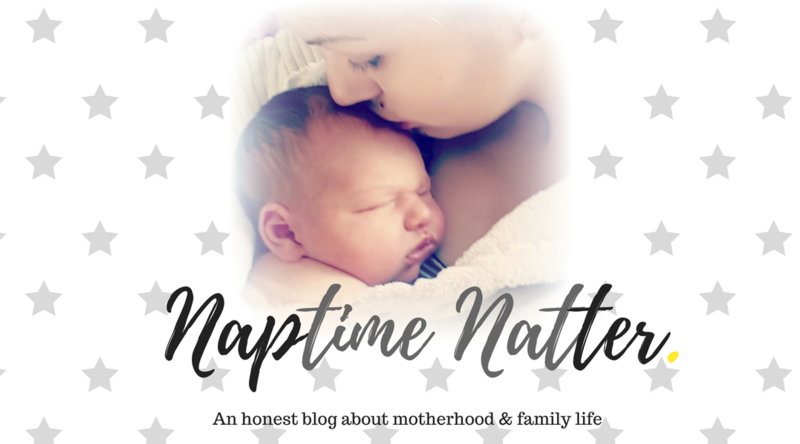 Well, the lovely people at HiPP are giving my readers the opportunity to win a hamper of yummy first taste goodies for your baby. To enter just fill in the rafflecopter entries belowe – good luck! 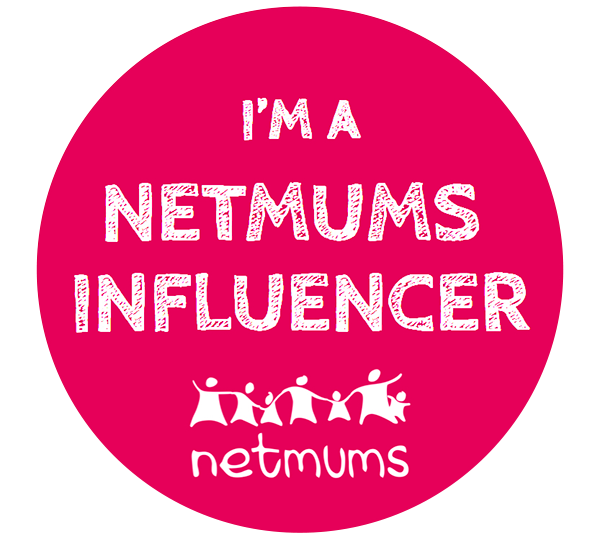 Winner’s details will be passed on to HiPP Organic, Naptime Natter is not responsible for sending out the prize. 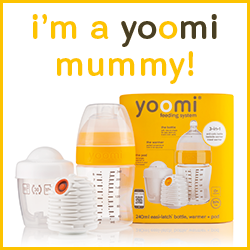 Have you started weaning your baby yet? Have you tried the HiPP Organic jars before? 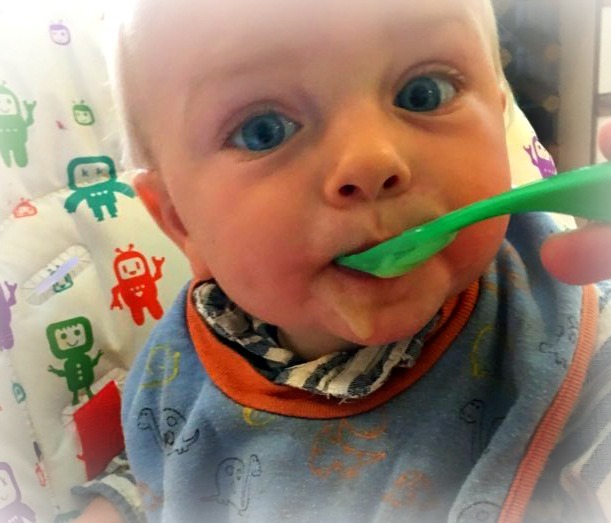 Good luck introducing your little one to solids, it’s an exciting and very very messy time! Disclaimer: I am part of the HiPP Moments blogging team. I was sent a hamper of HiPP Organics jars to try in exchange for this honest review. All words and opinions are my own. The Fish pie with vegetables – bet it tastes lovely to little ones! Avocado, banana, chicken, pasta, noodles, toast, lentils, rice, mashed hard-boiled eggs as well as yoghurt, fromage frais and custard. The fish pie and vegetables sounds yummy can’t wait for my Grandson to try this one. My son is 5 months so we will be starting weaning soon. I am just so excited to see how he responds to everything to be honest!